In this 3-day masterclass you’ll learn how to create highly detailed and intricate life-like silk flowers of the highest quality. 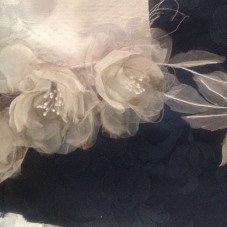 Loreen will start by giving an introduction to the various flower parts and the co-ordinating pattern pieces, then you’ll move on to prepping the fabrics with sizing, cutting out the pieces and then hand painting for shading and depth. You will learn techniques for using flower irons to shape the parts, before assembling all of the pieces into beautiful handmade silk flowers. 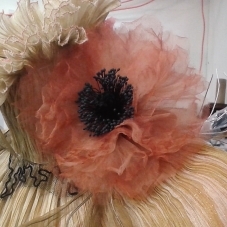 This class is suitable for professional costume-makers and milliners who want to make bespoke trimmings for their garments, and those who wish to develop their existing flower-making skills to a high standard. The class takes place at Hat in the Cat, Bridgend, Perth. 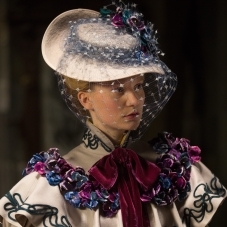 Loreen Lightfoot is a world-renowned Milliner and Costumemaker. She studied Fashion Technique and Design where she learned the groundwork of Millinery and Flower Making. She has continued to take workshops over the years, most recently Jane Smith’s 19th Century Straw Braid Masterclass. She has worked in fashion and theatre and now works predominately in film in North America. Her film credits include Chicago, X-Men, Blues Brothers 2000, Good Will Hunting, Robocop (TV series) and Starsky and Hutch. See her full list of credits on IMDB.